Prestige Valley Crest: Modern homes in Mangalore! Mangalore has always attracted homeowners, due to its pleasant environment and enriched social infrastructure. If you are willing to buy luxurious apartments in the city, you can have a look at Prestige Valley Crest. The residential complex has scheduled to open up for the homeowners in October 2021. Home-lovers willing to embrace a comfortable abode can book their apartments now. You will enjoy a classy lifestyle when you move to the residential complex. It has got a wide range of amenities for the homeowners. You can buy 1/2/2.5 and 3 BHK apartments in the residential complex, developed with customized features for the residents. The apartments are sophisticated and come with a good mix of luxury and comfort. Well, if you are planning to move to Mangalore, these apartments can fulfill your housing aspirations. The residential complex comes with the reading room, badminton court, steam and sauna, car parking space, mini theatre, squash court, and much more. The residents can enjoy the beautifully landscaped gardens in the residential complex. The apartments have uninterrupted power and water supply 24/7 and the security facilities in the area are upgraded. The complex also has an aerobics room. The interiors of the apartments are sophisticated, and the vitrified tiles in the living and dining enhance its looks. You will enjoy the wide balconies and open green areas around the apartments when you move to the Prestige Valley Crest Bejai. If you have a fascination for green living, you will find the right home in the residential complex. Mangalore is one of the most important cities in India, known for its commercial value. Being the IT capital of the country, it has tremendous employment potentialities for the residents. Several blue-chip companies are coming up in Mangalore. The demand for quality homes in the city is on the rise. Investors from various parts of the country are interested in these apartments. The Prestige Valley Crest Price ranges between 36.51* lakhs up to 86.16* lakhs. With increasing demands, these prices are likely to rise in the coming months. For investors and homeowners, this is the right time to book their apartments. The transportation system in Mangalore is well-developed and ensures quick connectivity to the important places in the city. The commuters can reach the desired destinations in time. The educational and healthcare infrastructure in Mangalore is well-developed. The important schools in the region include Bejai Kapikad School, Lourdes Central School, St. Ann's High School, Presidency Nursery School, Mangalore One CBSE School, and Sri-Sri Ravishankar Vidya Mandir. The important hospitals in the area include City Hospital, Yenepoya Specialty Hospital, S.C.S.Hospital, and KMC Hospital, among others. The residential complex comes with several lifestyles and fitness amenities for the residents. You can enjoy the swimming pool, gym, indoor and outdoor games, clubhouse, and much more in the complex. The prices of apartments in the region are rising. 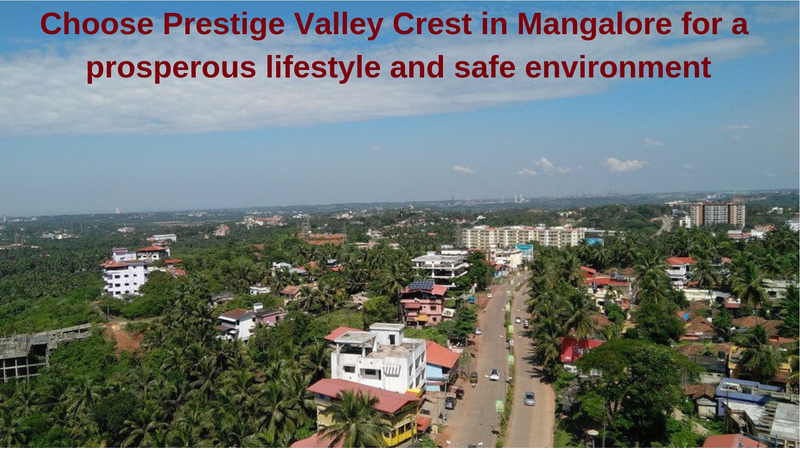 If you are willing to buy properties in Prestige Valley Crest Mangalore, this is the right time to make your investment. Buy luxurious apartments in the residential complex and live up to your housing dreams. Prestige Valley Crest awaits you with quality homes. Mangalore is a major economic player of Southern India. The name of the city originated from the Mangaladevi temple located in Bolar. It has the well-established infrastructure in commercial, educational, industrial and service sectors. The city owns its importance to the manufacturing industry, agricultural processing, and port-related activities. One of the foremost port cities of India Mangalore is a major export point for coffee and cashews. The beautiful picturesque city has a very rich cultural background. The city has a very diverse community with several native languages and beliefs. Various local languages use different names for the city like Kudla in Tulu, Manjarun in Sanskrit, Kaudal in Urdu, Mangalore in English, Mangaluru in Kannada and many more. The city is home to some of the best educational institutes of Karnataka. With several famous tourist attractions, tourism is encouraged in the city. The city also has an international airport to its name. A prime location in Mangalore, Bejai provides a peaceful green environment outside the concrete jungle of the main city. It has every facility needed in an urban city including KSRTC Bus Stand, Bharath Mall and Circuit House. It has resources to fulfill your every demand, from fresh fish, meat and vegetables markets to branded outlets, Big Bazaar, Pizza Hut, and pubs. Known for its contemporary architecture and design the city has some of the tallest buildings of Mangalore. MG Road runs close to Bejai and keeps its residents in direct touch with various parts of the city. Chirping sounds of birds, light rays of sunlight, wonderful green areas, modern comforts, sophisticated lifestyle, do not you think to live around there? Why not, everybody wants all these pleasant offerings and magnificent nature views. Now, all these desires can become true as a new project in Bejai, Mangalore is spreading its glow. You have heard a lot about Prestige Constructions, under their guidance, the property has been developed into a luxurious resort will be available for ready-to-move-in from Oct 2021. The estate has been nested between all the public and social facilities and for the convenience in traveling, connectivity from here is extremely smooth. Experience the greatest level of luxuries and visit the complex ASAP. Vitrified tiles in the foyer, living, dining.